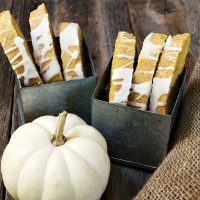 Delicious and pleasantly spiced pumpkin biscotti. These will not get super hard, due to the moist pumpkin and the butter, but will still be a great side for your Fall coffee and tea. Preheat oven to 300° F. and line a baking sheet with parchment paper. Set aside. In a medium bowl, combine the flour, baking powder, salt and spices. Whisk well to combine. Set aside. In a large bowl with a hand mixer or the bowl of a stand mixer fitted with a paddle attachment, cream the butter and sugar together until light and creamy. Add eggs, one at a time, beating well after each addition. Add vanilla and pumpkin and beat to combine. Add dry ingredients and mix until well combined. On prepared baking sheet, spoon dough into two logs about 3 inches wide by 12 inches long (leaving as much room in between as you can as they will spread a bit). The dough is very moist, so using moistened hands, shape and smooth the dough as best you can. It doesn't need to be perfectly smooth. Your goal should be just to make it a uniform thickness and width, so it bakes evenly. Bake in preheated oven for 40 minutes, or until firm and sounding hollow when tapped. Remove from oven and allow to rest on the pan for about 10 minutes. Remove logs to a cutting board and using a serrated knife, cut into 1-inch slices. Return slices to baking sheet, with cut side down, and bake 10 minutes. Turn biscotti over and bake a further 10 minutes. Remove to a cooling rack and allow to cool completely. If desired, top with an icing sugar glaze. Add icing sugar to a small bowl. Add enough hot water to form a thin glaze. Line cooled biscotti up so they are right up against each other (so the drizzle only goes on top and not down the sides). Drizzle glaze over biscotti and leave to set. Store biscotti at room temperature in a not-quite airtight container. Biscotti will soften somewhat the longer they sit.